Life on a farm. With pigs, goats, chickens, land, room for the grown kids to start their own families, room for the kids to run and play and learn responsibility. Fresh air, dirt, space. Pretty much a dream of mine (one of them anyway, traveling the Americas full-time with the kids and a camper is another huge one). 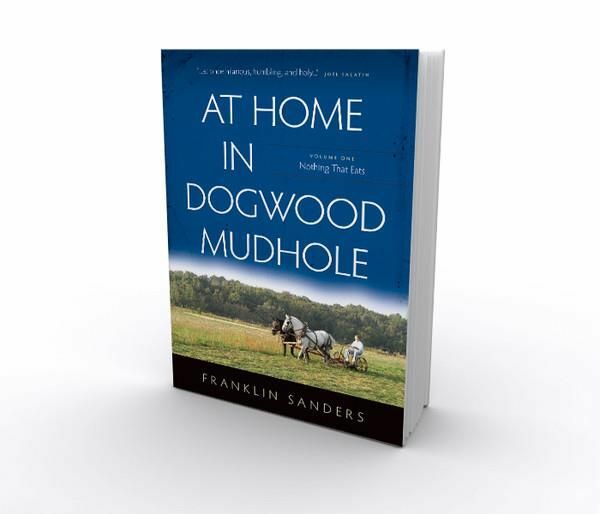 At Home in Dogwood Mudhole, Volume 1: Nothing That Eats tells the story of Franklin Sanders moving his family to such a farm pre-Y2K and sounded like a book that could have me happily daydreaming for a very long time. This softcover book is 379 pages of personal letters, written chronologically, from Franklin Sanders to the readers of his newsletter, the Moneychanger. 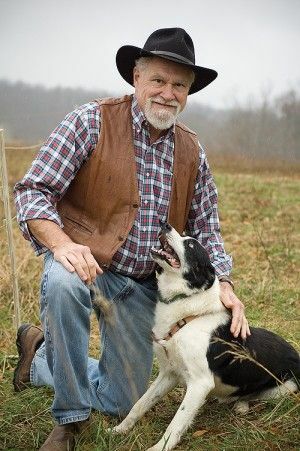 Those personal letters were collected and edited to create At Home in Dogwood Mudhole, a 3-volume set of books (this review is the first volume) about life from a smaller home, to having a few chickens on a small rented plot of land, to a full-fledged farm. The book covers the successes and failures of learning to farm (there is quite a learning curve with chickens in the first half of the book! ), while also showcasing family life with a patient wife and seven children, American history, small town life, Y2K concerns, and his faith and tenacity. This is not a romanticized account of a bucolic life in the country (though some of his visits to other small towns created an instant desire to toss the kids in the car and go, we've added a few places to our "must see" list), this man and his family, and even the animals, struggle to make it to their land, and then on their land. They never give up, however, and seem to find the beauty, or at least the lesson, in everything they experience. The book also discusses Franklin Sanders' view on the government as he deals with tax issues; while I didn't necessarily agree with his point of view I appreciated hearing it. In particular, I enjoyed his stories about his wife. His admiration and respect for her shines through in his writing and I found that to be very refreshing and enjoyable. Even when he relays something she does that's less than terrific he finds the positive in it and admires, rather than criticizes, her. I did enjoy the overall context of the book and did find it very heartwarming. For some reason, though, this wasn't an easy book for me to read. I expected to be drawn in and fall in love, but the book never totally hooked me. I can't exactly put my finger on what it was that didn't "click" for me. I don't put a lot of time into reading for pleasure. I'd like to, but I just don't have the time, so perhaps I'm just out of practice. There was plenty of description in the book, and I could certainly picture the scene, so it wasn't that. Franklin Sanders writes as if he's speaking to you, which is generally my favorite writing style, and I think I might have been more drawn in to the book if I'd googled and found a video of him speaking, maybe putting a voice to the words would have made it click? Fortunately, while the book fostered my desire to find a farm in the middle of nowhere and move the kids and cats I wasn't hooked enough to actually go do it today! Kaden, age 10, read about half the book as well and found it to be a good, laid back, easy read. The book is geared more towards adults, but there is nothing in it's wholesome content that isn't appropriate for kids. At Home in Dogwood Mudhole, Volume 1: Nothing That Eats is available for $22.95 for the paperback version or $16.95 for the Kindle version. Volume 2 is also available. If you have the chance to read the book I'd love to hear what you think of it. Click to read more reviews from the Schoolhouse Review Crew. On behalf of the Sanders family, thank you for taking the time to read the book and post your review. We would like to let your readers know they can get free shipping (for up to 2 books, to US addresses only) by using the discount code TOSFREE at checkout. Thanks again, and God bless!